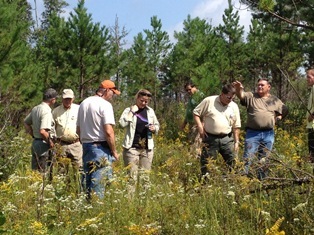 Clarence Coffee, 2nd from left, discusses the savanna flora with workshop attendees. Clarence, retired TWRA, was instrumental in promoting the need to restore these landscapes to support threatened wildlife and plant species. 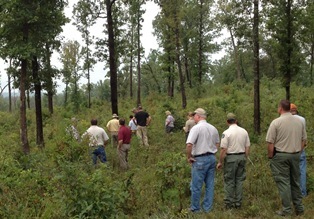 Workshop participants investigate the effects of burning on Catoosa WMA. On September 5-6 FLC’s Land Director, Meredith Clebsch, attended the Woodland and Savanna Management Workshop in Crossville, TN. The program was put on by the Central Hardwoods Joint Venture and TWRA to support the restoration of landscapes, especially in the plateau region, to historical woodland/savanna communities that support grassland bird species. Grassland birds are among the most imperiled of all North American birds primarily due to loss of historical habitat. It is estimated that less than 1% of this habitat remains. Included in this group of birds are Northern bobwhite quail, a number of sparrow species, Prairie and Blue-winged warblers and yellow breasted chats. These communities are known to have occurred across large acreages in the middle Tennessee and western Kentucky region priorto human habitation. Many of thesecommunities have been vastly altered from their original state due to fire reduction practices and agricultural activities and may no longer be readily recognized on the landscape. However the structure and diversity of plants they support are critical to many declining grass and shrub-land species. The workshop was developed to aid land managers in understanding the components of woodland and savanna communities, the value these vanishing landscapes provide, and how best to restore these critical habitats. The information presented provided land managers and consultants with resources to better understand savanna and woodland community types and the knowledge to better manage these forgotten ecosystems. In a nutshell, what has to happen is the reduction of the tree canopy to something less than 50% to allow enough light to the ground for a diverse mix of grasses and other herbaceous species as well and shrubs to flourish. This means most of the sub canopy is removed. Much of the discussion focused on the use of fire and what the most effective burning schedule is to establish and maintain these landscapes. We observed the results of various fire management regimes in a tour of Catoosa Wildlife Management Area which has been working to restore these landscapes since the mid-1980s. Burning in the growing season, August and September, is now being recommended as most effective for reducing the woody cover. Now that FLC has thousands of acres in easements on the plateau and more to come, we hope this information will be useful to those concerned about wildlife habitat management for this important community. For more information about this topic visit the Central Hardwood Joint Venture.